Blue phases often appear in chiral liquid crystals as arrangements of so-called “double-twist cylinders”, characterized by twisting in all directions perpendicular to the cylinder axis . Magnetic moments in chiral magnets tend to form spirals, and one can thus speculate on the existence of magnetic “blue phases”. By combining model calculations with experiments, we show that such a phase does form in MnSi over a large part of the phase diagram, including at ambient pressure . In chiral magnets, calculations performed in the large-pitch limit show that spirals with a well-defined twist direction (helical order) should have a lower energy in magnets, and that blue phases cannot appear.39 Despite this result, a blue phase has been suspected to occur in the itinerant chiral magnet MnSi at high hydrostatic pressure, where a so-called partial magnetic order has been observed . In collaboration with A. Hamman, T. Wolf, and H. v. Löhneysen (Karlsruhe Institute of Technology) and D. Reznik (University of Colorado), we have performed calculations starting from magnetic moments of the same fixed magnitude, with random orientations, and placed on simple cubic or B20 lattices. The orientation of each moment was optimized sequentially in random order until the total energy of the system stabilized. A typical spin arrangement obtained by this method is shown in Figure 1 (top). The topology is the same as for blue phases of chiral liquid crystals, i.e., with moments twisting away from cylindrical axes. We tested our model via experiments on the 4F cold triple-axis neutron spectrometer and on the Papyrus small angle neutron scattering (SANS) diffractometer. The magnetic correlation length is expected to be reduced by Fe-doping similarly to thermal fluctuations. According to our model, Fe doping should allow the blue phase to persist to lower temperatures. Experiments show that this is indeed the case: Tc decreases with Fe doping  and the SANS spectrum of Mn0.8Fe0.15Si at 1.5 K is a ring characteristic of the blue phase (Figure 1, bottom). The same result was obtained for Fe1-xCoxSi , pointing to a universality of this phenomenon. 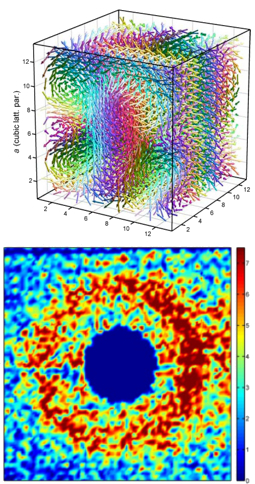 Our results provide a blueprint for understanding cubic chiral magnets, including MnSi, by showing that the frustrated nature of the magnetic interactions naturally and generically induces complex spin arrangements, which had so far been found only in liquid-crystal blue phases. Controlling special properties of this blue phase with impurities in thin films has a potential for new applications, particularly in electronics and magnetic memory devices . A. Hamann, D. Lamago, H.v. Löhneysen, D. Reznik, (submitted to Nature Materials). C. Pfleiderer et al., Nature 427, 227 (2004). N. Manyala et al., Nature 404, 581 (2000). S.V. Grigoriev et al., Phys. Rev. Lett. 102, 037204 (2009). X.Z. Yu et al., Nature 465, 901 (2010).